The primary reason thermal mass flow meters are popular in industrial applications is the way they are designed and built. They feature no moving parts in a nearly unobstructed straight through flow path, require no temperature or pressure corrections and retain accuracy over a wide range of flow rates. Straight pipe runs can be reduced by using conditioning elements and installation is very simple with inline and insertion options. How do Thermal Mass Flow Meters work ? 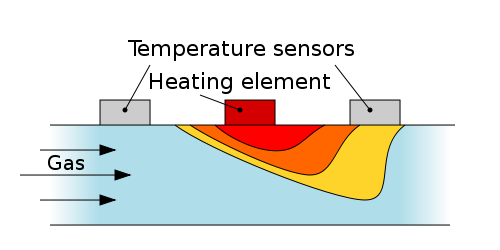 In the example below, the MEMS (CMOS) type flow sensor senses flow by the calorimetric thermal mass flow measurement principle. A micro-heater is placed in the middle of two temperature sensors symmetrically positioned at upstream and downstream points. The cavity below the micro-heater and sensors plays the role of thermal isolation as it is filled with the gas. When the flow passes through the micro-heater, heat is carried away by the flow medium, and the temperature differences measured by the up- and down-stream temperature sensors are directly proportional to the mass flow of the flowing medium. Proper prior calibration is required by the manufacturer dependant on gas type. The thermal load is created by a constant-power heater. Due to the size of the measurement element, chip flow devices such as this can be very small and consume very little power. In contrast to through-flow constant temperature anemometry and thermal bypass technology, these tiny devices can have extraordinary response times when paired with a well-tuned control package, even as fast as 50 mS. Thermal flow meters are used in applications that have vapours present, as well as gases that are considered “wet,” such as digester gas. If actual condensation is present and it comes into contact with the sensor, then this can cause a spike in the reading due to the additional cooling effect. 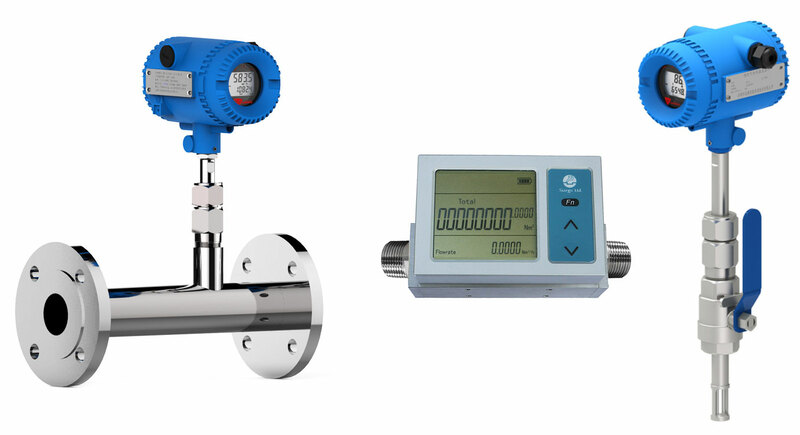 Other types of Thermal Mass flow meter exist including; Thermal bypass, Through-flow constant temperature anemometry and Laminar flow differential pressure. They each have their own advantage and disadvantages over one-another.